The Army had a new man on duty, newly in charge of recruiting at the shopping center. He figured he could do it well, having the trust of the entire United States government. The old man was retiring. He walked with a leg that had a limp in it, which would likely only get worse. The old man limped in after the welcome party and charged the new man with keeping the office safe. Such vows aren't necessary in the military, but the new man vowed it anyway. Years passed, and recruitment activities were extremely successful, to the point it was ridiculous. The new man recruited just fine, helped by keen macho advertising, various psychological techniques of persuasion, and a bad economy. Every time the new man -- who was aging all the time -- saw his success he'd feel a warm glow. He'd do celebratory things, as we all do, like throwing a dart at the dartboard or polishing an apple. He was the cream of the crop. Time continued to pass, until the shopping center was showing its age, wear and tear. Plus, demographics took their toll, the bad economy he depended on cutting both ways. Shoppers took their meager dollars elsewhere, Walmart. Stores closed, traffic slowed. Rentals hit rock bottom and the shopping center management had no choice but to throw up their hands and throw in the towel. But until the bitter end, the Army office was open. The officer was faithful, still hoping to make a go of it, even making deals with dope-heads in the vacant parking lot. "If we give them something to knock 'em out, we can shanghai them and they won't wake up till they find themselves in basic." That was a great idea, but there was still the matter of the shopping center's sad owners tearing their hair out. The place had to close. The officer, of course, had no choice then but to order the flag lowered and vacate the post. A couple days later and the place was rubble. The officer stood looking at it. When who should show up but the old man, his limp totally gone as now he was in a wheelchair. The two met, and immediately the younger man was overcome with terrific shame as the old man surveyed the area. Who, without so much as a handshake, rolled away, tears in his eyes, shaking his head. The new man, now the old man, put his hand to his heart: "A few weeks and I'll be in a new office. Then soon afterward I'll retire and a new man will take my place. The first thing I must do is have him make a similar vow." 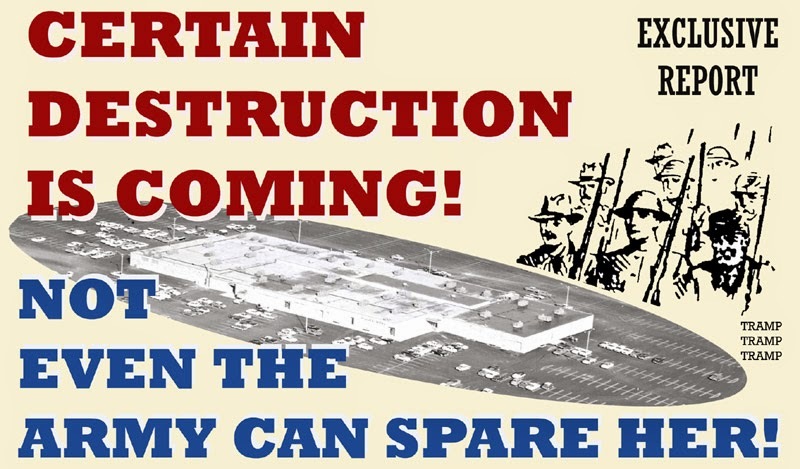 *There was an Army office in a shopping center that was eventually torn down. How Are Things in the Ukraine? What If I Had to Save the Kitesurfer? The Guy Made That Piano Sing!